How Will You Make A Hero? Join Make A Hero on Social Media! “My hero, Henry, was born on August 17, 2007, my third boy. He was healthy although smaller than my other children (birth weight of 5 lb 12 oz), he was otherwise perfect and beautiful. It was not until he was 8 months old and still not sitting up that his pediatrician recommended we have Henry evaluated by Early Childhood Special Education. By the time Henry was two and half and we still did not have a diagnosis, we were told by many well-meaning doctors and therapists that it was likely he would never have one. We were also told frequently it was likely Henry would never walk. 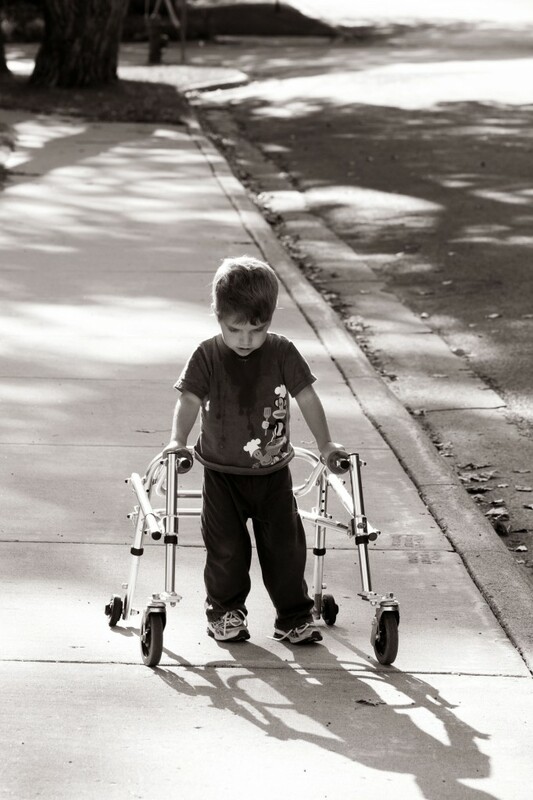 The doctor’s appointments, the therapy load, the lack of a diagnosis and now the possibility of Henry needing a wheelchair terrified me, but it also ignited a fire in us. We were convinced Henry would someday have a diagnosis and we believed he was capable, even if at a slower pace, of one day walking. If Henry could walk, we thought everything else would follow. We were told that development tends to “trickle down”, starting first with gross motor and then extending to fine motor and speech. 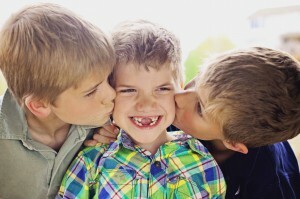 Desperately, we wanted him to be able to play with other children, most especially his two older brothers. We didn’t want him to feel excluded and we saw the divide widening with every passing year. We wanted him to be able to participate, to have fun, to be a little boy. Around the time Henry started walking independently, we began a new therapy for him at a therapeutic riding facility called Saddle Up. From the beginning I sensed that this was a therapy were the assumption was mainly that he was capable. 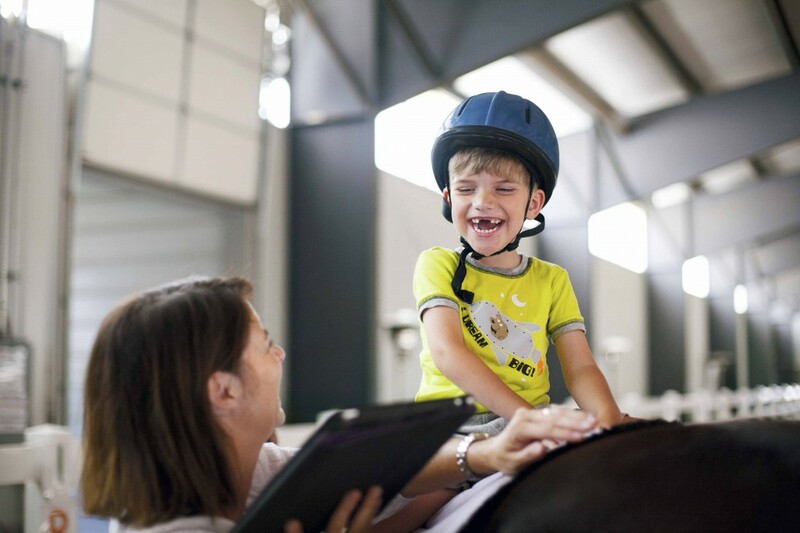 He was going to ride a horse independently with a therapist and two volunteers at his side. In a sense, Henry was participating in a form of adaptive sports recreation! They started with him just sitting and then progressed to hands and knees, knees only, and then standing for some of the ride. The horse would go fast and Henry would squeal with laughter. As a mother whose child had never experienced this freedom of movement, it was an absolutely amazing thing to witness! Despite what we were being told, a diagnosis was still extremely important to us. We wanted to know about quality of life and lifespan and potential health issues. Finally, six months after Henry’s blood was drawn, we were given a call that all tests were complete and the very last one came back positive for Pitt Hopkins Syndrome. To date, there are only 250 children worldwide with this diagnosis, Henry being the first ever to be diagnosed at the Children’s Hospital in Colorado. We found out that Henry is extremely lucky that he was able to walk at a relatively young age, has some words, and he doesn’t have seizures or more severe breathholding. What we did not expect to learn is that many kids with Pitt Hopkins are defying the clinical odds and are far more capable than expected. One such child is Liz. Her mother has posted photos and videos of Liz doing amazing things like hiking, biking, swimming on a swim team, boogie boarding. Liz and Henry and other kids with Pitt Hopkins are my heroes as they are defining in a very positive way what it means to have this diagnosis. Although the progress may be slow, they show great determination and growth, always with a smile on their faces. Please stay tuned for Liz’s full story next, as we build momentum alongside Make A Hero for Pitt Hopkins Syndrome International Awareness Day on September 18th. Leading up to that date, Henry’s ILC teacher has created this webpage to fundraise for Henry’s “Broncos Back to Football” run on Sept 7th! Contributions can be made via this webpage <– Feel free to follow my website, under the tab ‘Hope for Henry’ with updates on Henry and his progress. How has Henry’s story inspired you? Thank you for commenting below! *** Make A Hero is a registered 501(c)3, non-profit, creating adaptive sports films and media content, inspiring individuals with disabilities to enjoy the freedom of participation in adaptive sports & recreation. Wow, that handsome boy, Henry–we are utterly so proud of you and your family–you ‘rock’ boy!!!! Keep up the fight and the faith! Getting your story out with help so many….knowledge is power! It was so moving to read about how Henry got to the remarkabled point he he has now reached. Looing forward to future chapteres. From one PTHS mom to another: BRAVO!!! and Thank YOU! An amazing story! 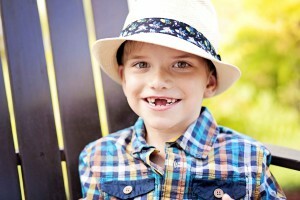 He has a truly infectious smile, hard to read his story and see his toothless smile without smiling myself. Thank you for sharing this Make A Hero, I look forward to your posts in the future! Im glad to have contributed to your campaign, keep your mission going! UPDATE: Veteran Jesse Murphree & Jasper – A Hero’s Thank You!